Pepperl+Fuchs’ ENI58IL Rotary Encoder features interlocked bearings and EMC protection that prevents damage from electromagnetic interference. The unit with BlueBeam technology uses a blue emitter LED and the corresponding receiver diodes. This technology keeps signals stable when exposed to mechanical force such as shock and vibration. 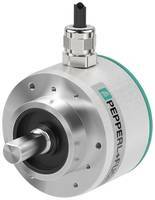 Twinsburg, OH - Pepperl+Fuchs introduces its newest innovation, the ENI58IL rotary encoder with BlueBeam Technology. For the first time, this technology equips industry-standard rotary encoders with the precision required for rotational speeds of up to 12,000 RPM. This is achieved by implementing a blue emitter LED and the corresponding receiver diodes. When used in conjunction with a powerful sensing chip, a highly efficient utilization of light is possible. "Compared to the long-wave infrared light that is typically used in conventional rotary encoders, the blue light from the new emitter LED has a shorter wavelength while at the same time featuring identical splitting width. This allows sharper imaging," explains Helge Hornis, Technology Director for Pepperl+Fuchs' Factory Automation Division. Due to the optimized functional principle, users can expect a new benchmark for signal quality. "With BlueBeam Technology, we also reduce the tolerance of phase position A:B to far below 10%," Hornis adds. Compared to the values that can be reached with conventional infrared technology, this more than doubles the signal quality. Because the high-frequency sampling is less prone to interference, BlueBeam Technology also keeps signals stable when exposed to mechanical force like shock and vibration. Another advantage is the improved calibration of the code disk, which goes above and beyond standard manufacturing procedures. During the production of ENI58IL rotary encoders, the precise insertion of the disk is verified on a microscopic level. This step leads to improved absolute accuracy for applications in which even the smallest deviations cause a noticeable loss of performance. In addition to the high measuring quality achieved with BlueBeam Technology, the ENI58IL series also sets itself apart in terms of reliability and durability: interlocked bearings withstand high loads and protect the ball bearing. Special EMC circuit protection prevents damage from electromagnetic interference. "Global use of rotary encoders often entails requirements that surpass minimum CE standards. For that reason, we quadrupled regular test levels to ensure accurate operation even under the most challenging conditions," Hornis says. Due to one-piece flow production, the ENI58IL incremental rotary encoders can be purchased in quantities as low as "1" and with a wide variety of features. Along these lines, various types of shafts (solid shaft, hollow shaft, recessed hollow shaft), flanges, (clamping, servo, square) and connections (axial and radial M23 or M12) are available. "With the ENI58IL series, we're introducing a well-thought-out portfolio of industry-standard encoders covering applications that up to now would have required special devices," Hornis explains. Pepperl+Fuchs, 1600 Enterprise Parkway, Twinsburg, OH 44087; (330) 486-0002; fax: (330) 425-4607; pa-info@us.pepperl-fuchs.com; www.pepperl-fuchs.com.